There are so many bloggers I love and for different reasons, I think most of you know Evangelie, the blogger behind Styleheroine and for those who don’t I hope you will fall in love with this blog as much as I do! Evangelie is point on when it comes to accessories and strong seasonal statements like her Burgundy look. Accessories like the gold polarized glasses, bunny ears and vast collection of shoes and bags! 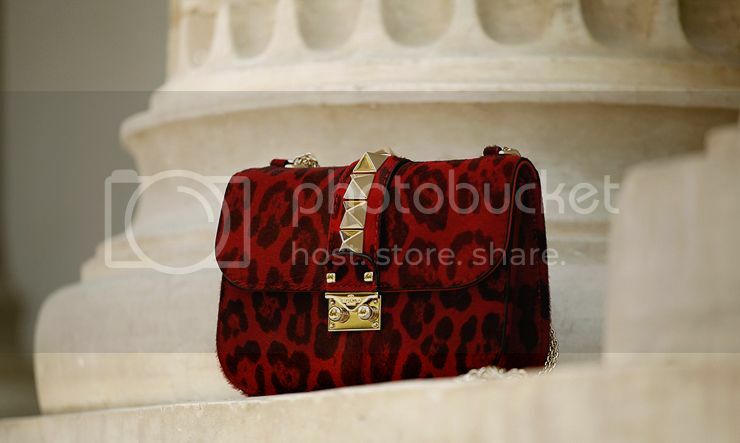 A deep red leopard printed bag? It couldn’t be a more perfect highlight and splurge for this coming fall, same with the gold polarized glasses which are the creme de la creme when it comes to the polarized trend! Styleheroine reads like more then a blog and her accessory finds read like perfect handpicked seasonal highlights! She’s absolutely gorgeous. I love her blog and her style. She has the best clothes. amazing pics, adore the stylings! waw! Great shots, loving that Valentino bag btw! Gorgeous! I love discovering new fashion blogs, so thanks for this! Those little ears in the first picture are just perfect! thank you so much!I’m beyond flattered to be featured on your amazing blog! Oh my God, can’t believe I haven’t heard for her till today, so good! Gorgeous, Awesome post, this is a very beautiful and interesting!! I love her style so much, and the best thing of her blog is that she sometimes writes funny stories. I really enjoy reading it. Love it! Great inspiration and the ear headband in the first pic is so cute! AH amazing! Wow those shoes! She has awesome style! THANK YOU FOR YOUR VISIT AND YOUR COMMENT. You are so right! She is amazing! I love her eye for the details! Love the pictures definitely going to check out her blog! Thanks for introducing me to her. What an amazing style she has. Thanks for sharing. Love her style. I am inspired already! i have been following her blog for almost a year already. imo she has the best eye for styling, mixing, and creating great looks with ease and elegance. Among the global fashion bloggers, she is a stand-out. I’d love to see her getting more commercial breaks, ie, editorial and styling works for major fashion houses and publications. She has a gorgeous style! I’m in love with the burgundy dress, it looks fabulous.